This is another one of those treats you guys get because of the artist and not so much me. Originally, what you see on this page was going to be the last panel on the previous page. But John felt like it was a big moment and had an idea of making it a big splash page to really sell it. I’m so glad he did. He was absolutely right to do it this way as it really lends a lot of power the scene and makes it even more bittersweet. Thanks, John! See more of John’s great work over at his site! MONDAY – 316 – “The Last Place Anyone Would Think to Look” Dr. Rocket’s flashback tale concludes! WEDNESDAY – 317 – “Why Dr. Klein Needs a Robot” The title says it all! 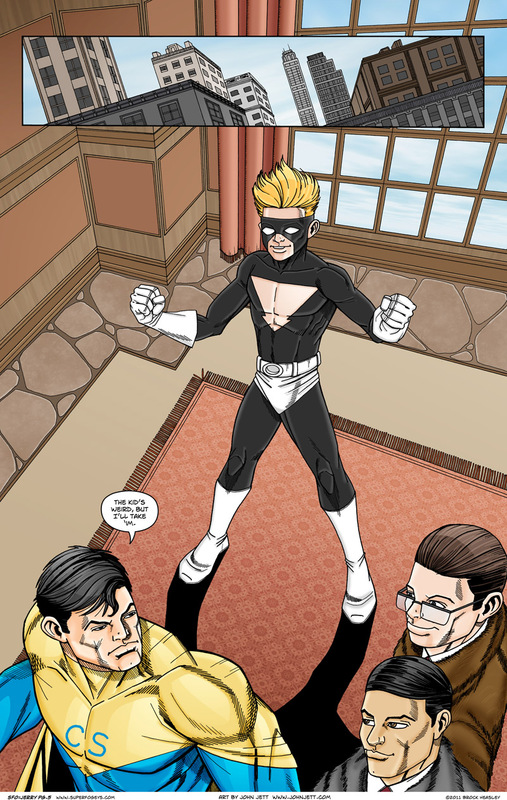 FRIDAY – Jerry, Page 6 “RIGHT MAKES MIGHT!” See the Society of Heroes in action as only John Jett could do it!